My school was a pulsating echo of thousand innocent hearts boomed in its hallways, which nestled millions of dreams rise and flew in classrooms, threw unruly chaos in playgrounds. It isn’t built with brick and mortar; it’s a manifest of the labor of love of two generations. My father and after him I took over. For over two decades my wife and I lived to bring up the school and nothing else would be on our minds except the affairs of the school so much so, never we sought, in the end, any gratification. Our hard work, painful but patience endurance has given a wealth of emotional dividends: a worthy goal; a blessed chance to groom thousands of children to learn and grow. Suddenly all the academic experience, I have amassed over the years went dormant in one instant. I quit from the arena of teachers, children, and schooling. Run-over by bitterness the events pushed me into unexplained insecurity of my capabilities. Farther, any amount of persuasion from many friends about starting a new unit of school didn’t excite any inspiration, to see me back in action. Life in school, a long –drawn-out devotion, ended hurriedly, like a tragic love story without a sequel. But I couldn’t disconnect from the web of memories. 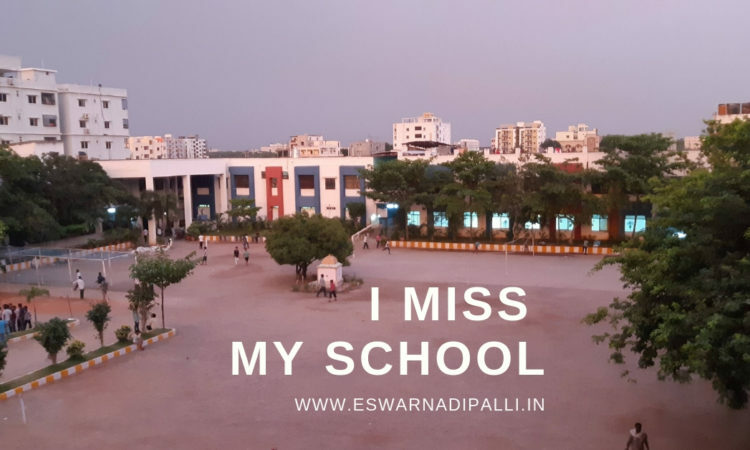 They have been held loosely hanging somewhere at the side-lines of daily schedules meant to keep myself engaged, as I continued to live in the school premises. Daily, as I walked along the second-floor corridor, I could hear from the playground below, a clamorous chorus raised in unison would reach my ears. When I peeped down the view was something I prefer to be glad about. Children in their sweating carefreeness; clusters of boys and girls swinging, chatting, teasing, bowling, running, jumping; playful flicks of pranks, mocking naughtiness – the childish hints of soldering flares of their sprouting friendship. ‘How youthful spirits soar as the day progressed’ watching the screams of delight I couldn’t conceal an envious grin on my lips. The whole high spirited noises, in the briskness of hundreds of youngish feet moving hurriedly across the campus, had one nostalgic domino effect. I have to hold myself steady to the whipped up memories that were locked away tight and forcefully gagged. I never would want them to find a reason to become visible or vocal; the backlash is emotionally unbearable. I’m the principal, an administrator, and a teacher for twenty-five long years and breathed passion, and care to nurture my family owned school – Kennedy High School. The inescapable hum of memories kept swirling around whenever they found me having a quiet time, doing nothing but staring at a distant skyline coming up surrounding my campus, or staring at the ceiling watching lizards chasing, or bored mulling at the empty word page with cursor pulsing. I missed many things – how I loved teaching and maddening din in classrooms; the flashbacks keep driving me up and I’m in disarray and clueless how to dodge the sticky mess of recollections buried deep but heavy enough not to ignore. I missed the joy of handwriting: a king like culture perfected by my father in the school he started in 1975. Enter any classroom, watch any of the blackboards, open any notebook, behold any teacher, scrutiny any answer sheet. I welcome you to our classrooms; the land of penmanship where the art of writing by hand praised and raised to an unbelievable perfection. My father spared none be it a toddler or a grey-haired teacher; he believed the brain is at its best when handwriting flows through fingers as beauty. I missed the blackboards carrying written words clear, and beautiful, the teacher standing in front pride in her face, and artistry in her fingers. Teaching became a blessed responsibility, as I grew, which defined, eventually, what I’m as a person. From early days on I held a view if people have to respect me, remember me as a good teacher, I believed I have to seek opportunities to show I care. I knew as a principal I need behind the benign support of teachers for whatever proposals I chart for children. The quickest way I found out was to show everyone I cared for them no matter how small the consideration. I gave them the freedom to be what they are; make sure they aren’t burdened with trivial tensions: a precursor to good relationships that led to effective teaching. To achieve the cause, I laid out for myself a reformative formula. If teachers were to be exemplary, I need to hold an emotive vibe in my teaching style wherein I could become a mentor for a new way of guiding. I always wanted instruction in a manner to channelize the children to take on each day and fill it with simple things like joy, friendship, laughter and love for games. I collected as many books as I could on child psychology, teaching practices, self-help, anything that could help usher among our staff hard work, care and craving to teach well. Mostly, I’m found, in my office, with books and a pencil underlining the impressive verses. Later I typed those into teachable notes and prepared sparky slides. The notes spread in loose sheets; I wanted my sessions faultless, and fan confidence on every face. To hold their enthusiasm, I summoned all my wits; I read, reread, rehearsed again and again. I’m ready for a daylong seminar – in the art of good teaching, good caring, and hard work. It’s my effort to train them to believe in their abilities, what I meant it to carry the passion of a lifelong teacher. The school day functions and celebrations were days of unrestrained joy, a frenetic whirl of practicing, music, costumes, and rehearsals. Everybody ran cheerfully; tiredness never entered their bodies; those were the days the teachers, and the children disregarded exams and gaps in syllabi had never tensed up them. For weeks music filled the air, the smiles lifted the spirits, and the whole school jumped and sang in jubilation. The tests, exams, marks, tensions for a while got banished from hallways and classrooms. A few weeks of tomfoolery and nothing but excitement filled the eyes and minds of all the guys and girls of the school –sparkles, smiles, and laughter. I missed the confusion mixed with fear that anything could go wrong of the celebration; self-doubt would the program come out as expected. I missed the countdown moments: the parents dislodging the little ones, the bigger ones in scooters, cars, autos; my eyes kept a close check on arrangements, the safeguards well in place. I went round with a restless contour peeping into each room making sure everything progressing as planned as I scanned the paper in my hand. Teachers are nervous in their shadows of suspense, a dab of worry apparent on their faces. Will their group pace, perform, and swing better than the rest? They are busy getting them right; the last moment raps, giving a bounce to the moods, which seemed slightly cranky in their elaborate makeup, ill-fitting costumes. Too absorbed they didn’t even acknowledge my presence. Understanding their unease, at the moment, I’m one among them an equal with a tension-ridden face. I missed the tension, the anxiety, the exhaustive relief of an event well performed. The next day everyone enjoyed a holiday, and I slept being thankful for all the hard work and good efforts that awarded a fulfilling end. Hundreds of children entered our school portals with dreams and ambitions. For us, it’s all like the work of a gardener nurturing them with patience, labor, and attention. I created an empathic ambiance; guided everyone to know; each child has the entitlements that he deserves: a smile, a kind word, a listening ear, besides putting an honest effort into the best practices of learning. My past is the healing present I see it every day; a phone call, a visit, friendly wishes, time spent ruminating the wonderful old times; the way the good-hearted former students and teachers spend time with me and I see a twinkle in their eyes. Perhaps, I take it, to demonstrate their gratitude or show how worthwhile their beings are for having spent such a glorious time together in the past. It fills me with happiness, and I see them as the glitters of the bygone time which I find sentimentally tranquil and I get a feeling that the healing souls are back again close to me.